I *love* the plans for Beacon Hill. Any of the three would probably work for me — least of which the Tower option, though. Dan, I feel the same way. That said, I’m sure there’s some serious objections out there. Can anybody fill me in on what the big criticisms are? First, I’m not a fan of the upzoning of the El Centro property from single family to neighborhood commercial. I feel the City dropped the ball by not fixing a covenent on the property disallowing future rezoning, ensuring that the old school property would always serve as a community center and publicly-accessible open space. I respect and appreciate the mission of El Centro, but feel the community is losing out on open space by allowing the southern half of the property to be developed for private residential/commercial use. The portion of the property that has been used for construction staging for Sound Transit over the last several years would make a great neighborhood park, particularly being adjacent to the Lander street features. If the City does allow the upzoning, they should split the property and preserve the zoning of the northern half with the school building and only upzone the southern half. Also, I find it odd that the existing conditions drawings don’t show that the El Centro lot is currently zoned single family, requiring a significant upzone to 50-foot or 65-foot NC. Another complaint I have is with the 65-foot option. During one of the meetings that I attended, the DPD rep stated that 65-foot zoning would not be placed adjacent to single-family. Maybe they don’t consider being directly across 17th avenue to be adjacent, but I would if I owned one of the houses on 17th. A 2-lane street should not substitute for the need for a buffer between 65-foot and SF zoning. I think the tower option if laughable and unnecessary. However, I worry that having that zoning designation will delay or prevent the construction of smaller buildings that are a scale that the neighborhood can actually support, yet again leaving space undeveloped and underutilized. Chris, Your point on El Centro and closing the door on a park is one I’ve hadn’t heard, and I think it’s a good one. I totally agree with you about the tower. My understanding is the El Centro has plans to preserve open space in a “plaza” style. I absolutely support El Centro in the desire to add affordable housing to the services they provide. It’s a great fit, and badly needed. I support 65ft in general. 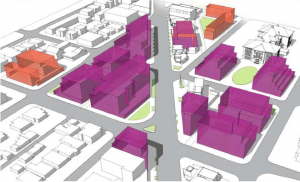 More than height, I’m concerned about design–the Council is voting on some proposed changes that would make it easier to build attractive buildings and harder to build the monstrosities that have eaten Ballard and Fremont’s souls. A brief “hurray!” that El Quetzal is applying for a liquor license. TWO places to enjoy margaritas on Beacon Hill? Yay! I’m very comfortable with the 65′ option, and the growth of neighborhood amenities that denser housing will bring. While I agree it would be nice to have a larger park in the business district core, I think that getting the huge new park space a short walk away over the reservoir makes up for it. I’m remembering when I lived near Group Health on Capitol Hill. There was no significant public space in the 15th Ave. business district, but we had all of Volunteer Park right up the street. I do agree with Melissa’s worries about design. There’s some fabulous modernist architecture going on these days that fits Seattle to a T, but there’s also a lot of soul-shrivelling dreck. It would be a nightmare if we ended up with the tower option and something on the hill like the new Escala building’s thirty stories of faux Miami hotel styling that is downtown’s latest eyesore. Being directly north of El Centro inside the Urban Village boundary, I wonder how long it’s going to be before upzoning starts happening in the adjacent SF zones. I recognize not everyone will be happy about it, but I think when the time is right it will have an overall positive impact on the hill and the city. Just thought I’d expand on my nightmare by saying that if we had a tower as beautifully designed as the Chase/WaMu/Seattle Art Museum building, it still would seem too much too soon. It’s like the three bears, and 65′ is juuuust right. Getting back to the question at the top of list, my criticism of the recommendations is the missing City investment in infrastructure. The State Growth Management laws require Seattle to do neighborhood planning. In that process the State also requires that the City plan for investments in public infrastructure: streets, parks, public safety, utilities, etc. This is called “concurrency”. This planning work is to be done at the same time as upzones to increase density. Many of us brought up this concern immediately, before meetings even started, because word on the street was that the City wanted to upzone without concurrent planning for City investments. This is essentially what we have in our update. Check out the level of specificity of recommendations in our “real” neighborhod plan from 2000 for street and park improvements. Where is the equivalent of our matrix in our 2009 update? Where are the specific street, park, and public safety recommendations? All other City plans have specific lists of projects with estimated budgets, timeframes, responsible department, etc. Our plan update has none of this. Because this isn’t a plan document, it is a propaganda piece with some good information and a plethora of omissions. What is the City going to do to improve Beacon Avenue, and public safety in the next ten years? What happened to all the very specific recommendations of the community that came out in the meetings? Ask these questions when you get to testify to Council on the merits of our “update”. Upzones without concurrent planning for City investment are a thinly veiled effort to increase property tax revenue without agreeing to spend that money in the neighborhoods where it is being raised. It contravenes the State Growth Management Act. Freddie, not to be contrarian, but doesn’t the “North Beacon Street Concepts Section” download specifically address improvements to Beacon Avenue? I don’t know about improving public safety, because I don’t have major public safety concerns about the neighborhood. We’ve certainly had our run-ins with petty crime in the neighborhood, but I hardly feel like I should oppose zoning changes I agree with because someone broke into our house. And as I said, the new park space seems like it will be a fantastic amenity very close to the newly dense commercial core. I haven’t gone to any of the meetings, so I don’t know what the tone of them is, but what I see reported back doesn’t really make me want to go. If relations with the city are as contentious and antagonistic as they are represented, then it’s hard to see how anything good can come from either side.